Visiting markets is a great way to see what's going on. Another running theme of recent emails is setting up an organic farm or a farm-to-table business in Japan. Folks often ask me to share my observations of the situation here even though I am not necessarily an expert. I completely support such ventures, whether its in Japan or elsewhere, but I do have a few bits of advice. Here they are. I know, I know. That sounds about as exciting as watching paint dry, but I stand by this advice. I've had the pleasure to review some excellent books this past year on getting started in farming. The two I recommend the most are Market Farming Success: The Business of Growing and Selling Local Food by Lynn Byczynski (Chelsea Green, 2013) and Farms with a Future: Creating and Growing a Sustainable Farm Business by Rebecca Thistlethwaite (Chelsea Green, 2013). Both are excellent starting points for those looking to make farming their business written by experienced farmers not shy to share. Whether you're in Japan, America, Nepal, Fiji, or Kazakhstan these two books are required reading. Frankly, if you don't read these you're wasting your time. Good farm fields should be planted with a diversity of crops to ensure pollination, protect from disease, and stave off financial ruin if a crop does fail. It's no guarantee, but it's a sensible practice that will take a grower far. The same holds true for business. Don't focus too much on just one crop, area, or customer. Drop that basket or get it knocked out of your hands, and those eggs will surely break. 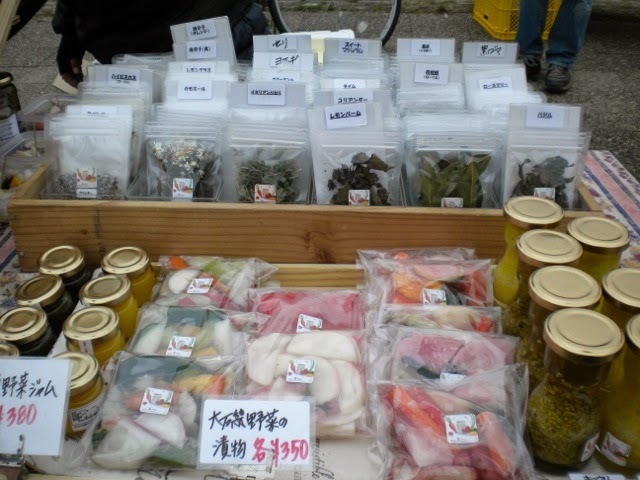 Particularly in Japan, growers and producers can't focus solely on the international community. We are a charming but fickle bunch that comes and goes. Balancing your target audience with a healthy dose of Japanese people interested in organic food, farming, yoga, crafts, etc. gives you a more stable customer base. This will result in a more stable financial base, too, while providing a unique cross-cultural experience for everyone involved. It may mean more work, i.e. bilingual materials and websites, etc., but in the long run it would be well worth it. I know it's hard to hold back. I go crazy every year at the nursery or in the seed store, and end up with more than my garden can hold. That's fine for my garden, but for a fledgling farm business it's not. Start small and simple. Set yourself up for success by growing a few crops, making a few things and then test them out at the market. David Buchanan in Taste, Memory: Forgotten Foods, Lost Flavors, and Why they matter (Chelsea Green, 2012) does a fascinating job of describing his journey as a market gardener. He debates the merits of buying a whole farm, renting, foraging, and finding a niche for his beloved heirlooms. There is much to be learned in his story for growers at all stages of the game. Getting too big too fast can mean too much to take care of and not enough hours in the day at the height of season, a frayed family life, and debt. All of that adds up to stress and a general feeling of unhappiness that can cause even the most passionate farmer to throw their hands up in despair or throw their back out mid-harvest. Don't do it. One of the things I found most surprising when I read Jack Lazor's The Organic Grain Grower: Small-scale, Holistic Grain Production for the Home and Market Producer (Chelsea Green, 2013) was his emphasis on finding a mentor, establishing a network. Every chapter, whether it was about a particular grain or piece of machinery or preparing the soil, mentioned someone he'd met along the way who offered advice, taught him an invaluable lesson, or led him to another indispensable resource. There are plenty of people needing to eat and not enough of them growing. Don't be shy to network and seek friendship among those who ply the trade you dream of. Farmers, for the most part, love to talk about their work. Some might be a little crotchety, but just go with it. Underneath is a good soul who most likely cares about good soil, good food, and community. Learn from them. I see this all the time at the markets here in Japan. Growers and producers talk to each other, share information, build a network that supports their own farms and other businesses. We all need each other, especially in the farming and food trades. They're a welcoming bunch. One of the first books I ever read from Chelsea Green Publishing was The Resilient Gardener by Carol Deppe (Chelsea Green, 2010) and it rocked my world. Deppe, a long-time grower and scientist, laid out in these pages a plan for gardening and food preservation in preparation for a natural, personal, or global disaster. (I started reading it a few days after the Tohoku Earthquake in 2011, so it struck a particularly strong chord with me.) Her advice on everything from water to tool usage to crops to plant is spot on and worth taking into consideration as climate change steps up its game. If we're to survive and perhaps even thrive, her book is another to add to the shelf. Got other thoughts or ideas? Send them along.